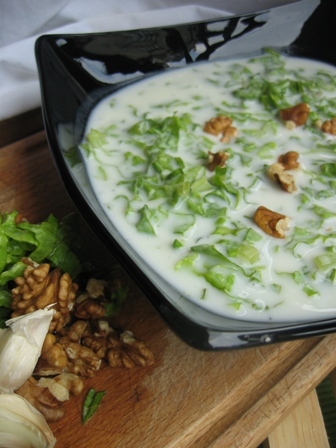 Tarator is traditional Bulgarian cold soup with yoghurt and cucumber. It’s especially refreshing on hot days, and it’s incredibly easy to make. Chop the cucumber into small cubes. Mince the garlic clove and chop it. Add the yoghurt, salt, dill and olive oil. Mix all well and pour down the water. It is served chilled and even with ice cubes.